Sunny location, breath-taking panoramic view and familiar hospitality – NEW from June 2019: outddor pool & fun pool for kids! Welcome to the Panorama Hotel Huberhof**** in Meransen/Gitschberg! The Oberhammer Family is glad to welcome you at the Panorama Hotel Huberhof**** located in a quiet and sunny position and offering a breath-taking panoramic view. Here you can spend a relaxing and unforgettable holiday in a pleasant and cordial atmosphere. Nature lovers can taste our genuine farm products. Sportsmen and active people can devote themselves to beautiful hiking tours along scenic trails, climbing and cycling in summer. In winter you can go cross-country skiing, explore alpine ski trails, toboggan runs, night skiing, snowshoe hiking and of course, you will have many opportunities for skiing and snowboarding. After an eventful day in the great outdoors, you can spend some relaxing hours in our wellness centre. 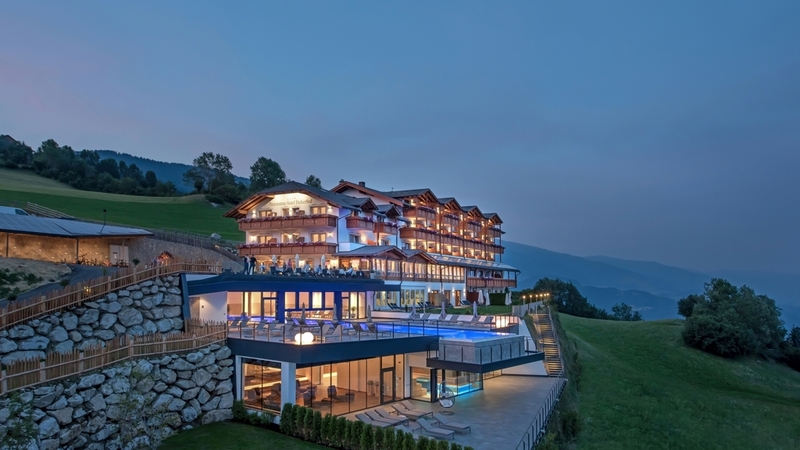 Moreover, the Panorama Hotel Huberhof provides a car park, a children's playground, sauna, indoor pool, sauna towels, deckchairs, a rich breakfast buffet, different menus and a varied salad buffet. From June 2019, we offer a new outdoor pool as well as a fun pool for kids. approx. 33 m² for 2-4 persons. The new Rooms Valley View "Deluxe" are located on the sunny side of the guest house on the first, second or third floor. They offer a south facing balcony with a beautiful view of the Eisack- and Puster Valley. approx. 51 m² for 2-6 persons. The new and spacious Suite Huberhof are located on the sunny side of the guest house on the first, second or third floor. They offer a south facing balcony with a beautiful view of the Eisack- and Puster Valley, as well as the surrounding Dolomites, the Peitler Kofel, Geisler Spitzen, Lang- and Plattkofel, Schlern, Plose,... Ideal conditions for larger families: Possibility for a family room with two separate bedrooms. AND: the bathroom has shower AND bathtub! approx. 24 m² for 2-3 persons The friendly and comfortable Meadow View rooms all have wooden floors. The north-facing balcony with a view of the fields and meadows of Meransen invite you to enjoy the romantic sunset in summer. approx. 24 m² for 2-3 persons The lightly Village View rooms located on the first or second floor and they offer a south-west facing balcony with a view of the village Meransen and the Eisack Valley. approx. 25 m² for 2 persons or 30 m² for 2-4 persons The friendly and lightly Alps View rooms are located on the sunny side of the guest house on the first or second floor and their south facing balcony offers a marvellous Panorama view of the Eisack and Puster Valley, as well as the surrounding Dolomites, the Peitler Kofel, Geisler Spitzen, Lang- and Plattkofel, Schlern, Plose,...). approx. 35 m² for 2-5 persons. Our spacious corner suites (35 m²) have two balconies: one facing south (panoramic view, sunrise and sunset), the other facing west (view of the village Meransen and the Eisack Valley, afternoon and evening sun). Suited also for families of 3-5 and separate baby bed. This spacious rooms (45 m²) with two separate bedrooms are great for larger families. One family room has a balcony with village view, shared bathroom, the children’s bedroom is located on the upper level and connected by a stairway to the parent’s bedroom. The other family room has a balcony with alps view, separate bathrooms, and a small pitched roof in the children's room. approx 43 m² for 2-6 persons The Family Suite Dolomite View are located on the sunny side of the guest house on the first, second or third floor. They offer a south facing balcony with a beautiful view of the Eisack- and Puster Valley, as well as the surrounding Dolomites. Ideal conditions for larger families: Possibility for a family room with two separate bedrooms (for 2 children). Romantic days for two! This offer is available throughout the entire season.